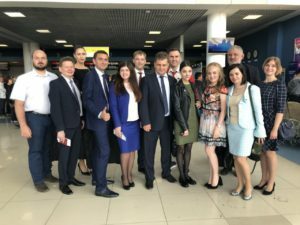 On May 21-28, 2018, representatives of the Russian youth associations will visit the Democratic People’s Republic of Korea. The invitation was made by the long-standing partner of the National Youth Council of Russia — the Kimilsungist-Kimjongilist Youth League. The Russian delegation included delegates from the All-Russian Public Youth Organization All-Russian Student Corps of Rescuers; All-Russian Public Movement Youth Assembly of the Peoples of Russia WE ARE THE RUSSIANS ; Youth Policy Department of the city of Sochi Administration; People’s Diplomacy Institute of the Asia-Pacific region; Club of Friends of the Gorchakov Public Diplomacy Fund; All-Russian youth public organization «Revolutionary Communist Youth League»; All-Russian public organization «Young Guard of the United Russia»; Fund of Social Assistance to students who have fallen into a difficult life situation; All-Russian Youth Public Organization «Russian Union of Rural Youth»; Youth Policy and International Relations Institute of the Moscow Technological University; All-Russian public youth organization «All-Union Leninist Young Communist League» (Komsomol); Newspaper Delovoy Peterburg. The delegation is headed by Grigory Petushkov, Chairperson of the Association of NGOs «National Youth Council of Russia». The program is expected to hold dialogues with the leadership of the Kimilsungist-Kimjongilist Youth League, visit to the exhibition of friendship between peoples, visit to the Embassy of the Russian Federation in the DPRK, meeting with students of the Kim Il-Sung University; Visit to the Museum of Youth Movement, etc. It should be noted that the Kimilsungist-Kimjongilist Youth League is the main youth organization in the Democratic People’s Republic of Korea, formed by the President Kim Il Sung in the 1920-1940.